The published mission statement of the Archaeological Survey of India (ASI) claims that it is the premier organization for the archaeological researches and protection of the cultural heritage of the nation. Maintenance of ancient monuments and archaeological sites and remains of national importance is the prime concern of the ASI. Besides it regulate all archaeological activities in the country as per the provisions of the Ancient Monuments and Archaeological Sites and Remains Act, 1958. It also regulates Antiquities and Art Treasure Act, 1972. I had reported few weeks back, how ASI has been dancing to the cues given by Government ministers and members of parliament and taking up endeavours that have really no scientific basis. ASI had taken up an unusual assignment to hunt for gold only because of the pressure from a federal minister, who in turn got inspired by a dream of a seer, Shobhan Sarkar. The seer had said that gold would be found at the dilapidated fort of Raja Ram Baksh Singh in the Buxar area of Unnao district in the state of Uttar Pradesh, India. He had claimed that the king appeared in his dream and told him about the treasure and the gold would be found after 15 feet of digging. In a most unbecoming act, ASI had actually started digging at that spot only to give it up after couple of weeks, as there was no gold and making ASI the laughing stock of the world. Now, in another curious case, two experts from Archaeological Survey of India (ASI) are being sent to Kabul, Afghanistan, to examine a begging bowl believed to be used by Buddha himself and initiate the process of bringing it back to India. In month of August 2013, a Parliament member from India, who comes from Vaishali town in Bihar state of India (where this alms-bowl might have been kept at the times of Buddha) wanted the bowl to be returned to Vaishali. Taking the cue from him, ASI has again decided to send this team to Kabul to "physically verify the bowl" as a part of the initiative to bring it back to the country. 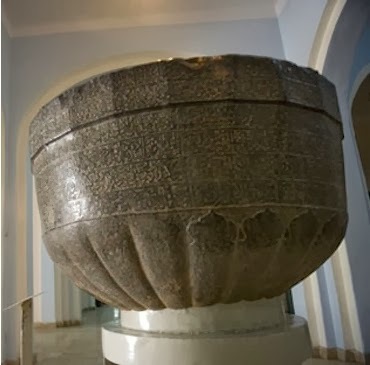 I think that everyone would agree that the alms-bowl, on display at the Kabul Museum, is perhaps one of the most important artifacts from India. It also happens to be an object of extreme reverence for Buddhists from all over the world. However, how much justified is the ASI, in trying to make this effort to reclaim it? Let us first see, how this artifact was discovered and how it finally landed in this museum and also why it really could be the begging bowl used by the great sage himself. In the year 1880-81, the then Director General of the Archeological Society of India, Major General A. Cunningham, made a tour of the Archeological sites of the Indian state of Bihar. During course of his visit, Cunningham visited a place known as ‘Besarh’, which was immediately identified by him as the famous medieval town of India known as ‘Vaishali’. Cunningham did not find any artifacts in this village. He however came to know a very interesting story that Buddha’s original alms bowl was preserved and celebrated for many centuries in this town. Cunningham collected more information about this story and wrote a note on this (Reference1) in his book. Buddhist texts have an interesting anecdote about this story. According to the anecdote, the original alms bowl given to ‘Goutama’ by ‘Mahabramha’ vanished when ‘Goutama’ became Buddha. Duly alarmed, the four guardian deities in Buddhism, Indra, Yama,Varuna and Kubera, each brought an alms-bowl made of emerald to Goutama, which he refused to accept. They then brought four alms-bowls made from stone of mango colour and all of them begged to Goutama to accept their alms-bowl. Not to disappoint any of them, Buddha kept all the alms-bowls and after placing them one into another, miraculously transformed all the four bowl in a single bowl, upper rim of which appeared, as if four bowls have been placed one within the other. In the days of Goutam Buddha, (5th century BC) part of Bihar or Magadha was ruled by Lichchhava Dynasty with Vaishali as their capital. According to Cunningham, Buddha had given his alms-bowl to the Licchavi king and people, when they took final leave of him at the old city on their northern frontier, which Cunningham identifies with Kesariya, 30 miles to the north-west of Vaisali. The famous Chinese travelers Fa- Xian (AD400) and Xuen Zang (AD520) have mentioned this story in their travelogues. Fa-Xian mentions that Buddha gave them (Lachchhvis) his alms-bowl as a memorial. Xuen Zang says that Buddha gave them his religious vase as a souvenir. In any case this alms-bowl was preserved and celebrated in Vaishali for next four to five centuries. In fact Vaishali city had become famous for this alms-bowl. 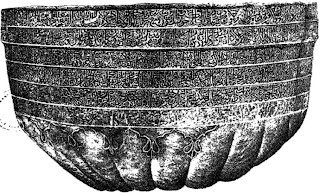 Buddha’s alms-bowl remained at Purushpur at least till AD 400 when Chinese traveler Fa-Xian saw it there and has described it in his travelogue. It must have been removed from here later because Xuen Zang (520 AD) and Song Yun have not seen it during their visits to Purushpur. However Fa-Xian describes in his travelogue, about an unsuccessful attempt in the third century, much earlier to his visit, to remove the bowl. He says that ” Buddha’s alms-bowl is in this country, and a king of the Yueh-shih got together a large army to attack this country, wishing to carry it off. When he had subdued the country, being an ardent supporter of Buddhism, he wanted to take the bowl away with him.” The king of Yueh-shih mentioned here, might be a Bactrian or a Khotanese King and attempt must have made to move the bowl to Kabul , Balkh or Khotan. This attempt however failed and the bowl remained in Purushpur only, where a pagoda and a monastery was built by this invading king with a garrison left there to protect it. 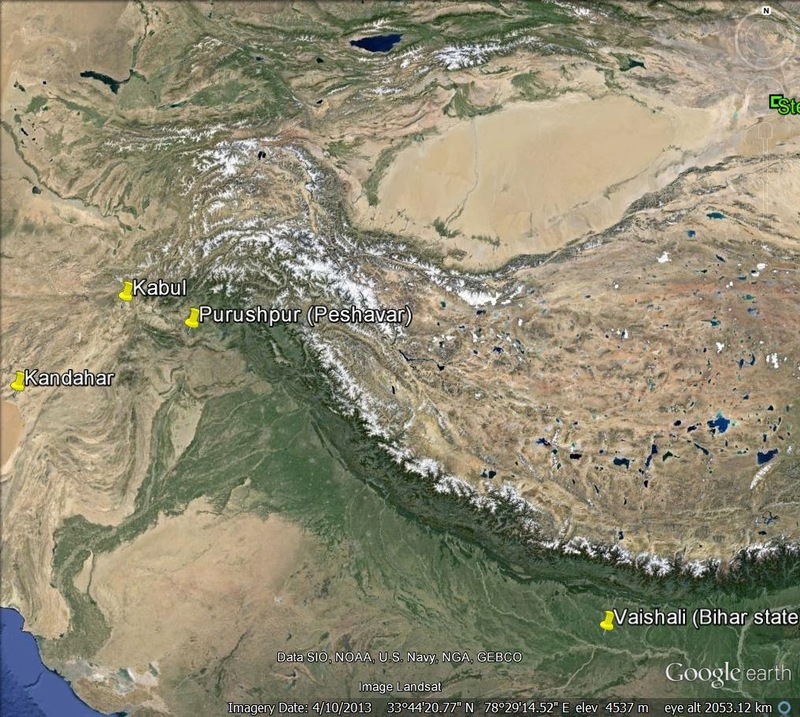 Around AD 425-450, Gandhara was again invaded by King of Yu Chi. This king despised Buddhism. After his invasion, the alms-bowl was perhaps moved by Gandhara people to a place also named as Gandhar, near present day Kandahar in Afghanistan. This was the reason, why Chinese travelers in AD 520 could not see the Alms-Bowl. The name ‘Gandhar’ given to this new place in present day Afghanistan, slowly corrupted to Kandahar. This place, where the Bowl was preserved, is known today as old Kandahar and the bowl was preserved here in an obscure mosque, almost till recent times. This bowl was near Kandahar city, till Mohamad Nasibulla became the president of Afghanistan and it was moved on his orders to Kabul museum only in last decade. During Taliban rule. This museum was attacked by Taliban extremists couple of times. By good fortune, it has survived there and still can be seen in the museum. We have only Fa-Xian’s description of the original bowl. Since Fa-Xian’s original writing had been in Chinese characters, three translations of the original work, which we have, differ to an extent. According to Remusat’s translation: ” The pot may contain about two bushels. It is of a mixed colour, in which black predominates. It is well formed on all four sides, about two lines thick, bright and polished.” According to Beal : ” The bowl contains about two Tan (a dry measure equal to if gallons). It is of a mixed colour, but mostly black. The seams, where the four parts join together, are bright. It is about 2 inches thick, and is kept well polished and bright.” The third translation is by Giles : “ It might hold over two gallons, and is of several colours, chiefly black. The four joinings are clearly distinguishable. It is about one-fifth of an inch thick, and is transparent and bright”. From the original pencil sketch obtained by Cunningham and the photographs of the Bowl on display in Kabul museum, my feeling is that the chances of this bowl being the original bowl, look quite high. The bottom portion has been shaped like a lotus flower, which could relate to an early Buddhist period. The Arabic character lines could have been carved later. This bowl is so huge that it must be a pot kept in a Buddhist Vihara to collect alms, just like what we have in Hindu temples even today and is commonly known as ‘Hundi’ or Charity Box. In ancient days, alms would be given in form of grains or gold ornaments, coins etc. This would make it necessary to have a large bowl for receiving the alms. 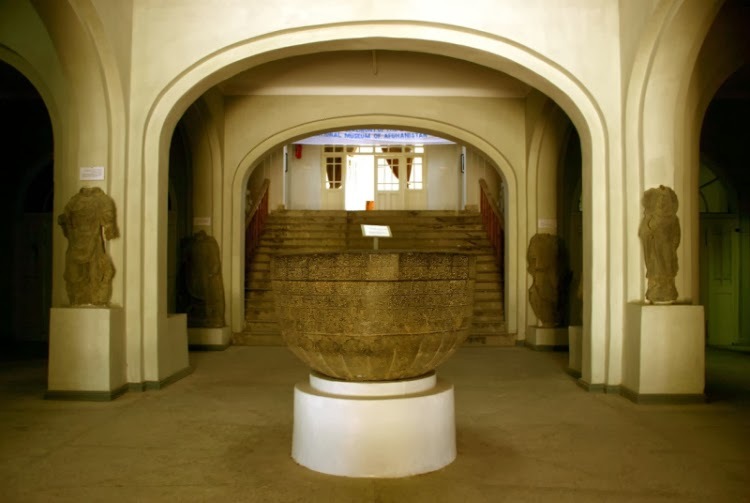 This all would mean that most probably, the alms bowl in the Kabul museum, is the one that was used by Buddha for collecting alms for his monastery. But does ASI has a strong legal case to claim the artifact under international art repatriation covention? Under which India can claim this bowl from Afghanistan. 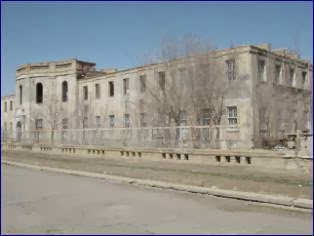 The 1970 UNESCO Convention on return of cultural property has clauses that say that any cultural property which has a fundamental significance from the point of view of the spiritual values and cultural heritage of the people of a Member State or Associate Member of UNESCO and which has been lost as a result of colonial or foreign occupation or as a result of illicit appropriation should be returned. However, museums in the other countries can keep the artifacts, if they are legally obtained and well-provenanced and documented. We might note hare that as a result of this convention, many museums in the western countries have accepted the 1970 date of convention as sort of cut off date for acquiring unprovenanced antiquities. 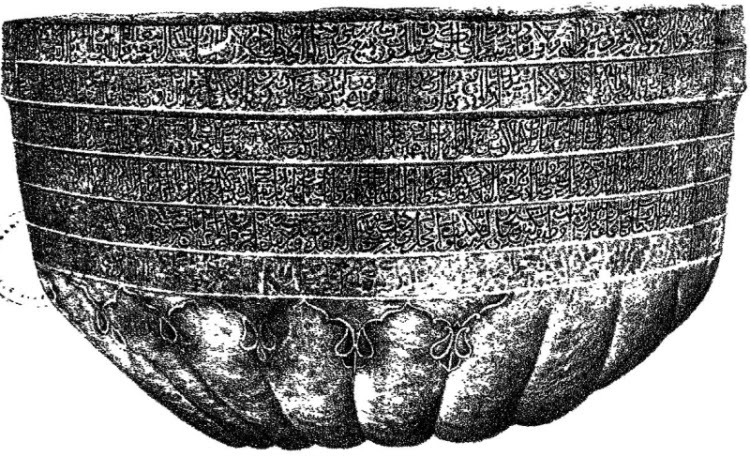 Buddha's alms-bowl was perhaps moved from Vaishali (Bihar- India) to Kanishka’s capital Purushpur (Present day Peshawar in Pakistan) by Emperor Kanishka in second century CE. It was still at Purushpur in 400CE as Chinese traveller Fa-Xian saw it there. It was moved to Kandahar sometime before 520 CE as both Xuen Zang and Song Yun had not seen it during their visits to Purushpur. This means that the alms-bowl has been in present day Afghanistan for more that fifteen hundred years. As I see it, there are two reasons for which, Afghanistan may not be under any obligation to return the alms-bowl. In the first place, Emperor Kanishka in second century AD was a monarch, who was ruling almost entire northern Indian subcontinent from Kandahar in Afghanistan in west to Magadha state (Today's Bihar state) in the east. If he had moved the bowl from Vaishali in Magadha to Purushpur in present day Pakistan, he had still moved it within his empire and no one could question his authority. The alms-bowl could therefore hardly be called as moved looted property. Secondly it has been established historically, that the alms- bowl had moved to Kandahar in Afghanistan sometime between 400 CE and 500 CE, a period far older that the 1970 UNESCO convention period, the year after which it is obligatory for the holding state to return the artifact. The bigwigs may be in the ministry of cultural affairs. The may be thinking that there is nothing wrong in getting á little help' from the ASI, to preserve the great culture of our great country.